The event is seeking Public Liability Insurance - $20 million. This is ski / splitbard race, very similar in concept to that of a ski-mountaineering race, as described in the International Ski Mountaineering Race Federations (ISMF) / Race Rules and Regulations Document (Click here to view). This will be the first of this kind of competition to be staged in Australia. The course will cover roughly 11 kilometres of snow or mixed coverage terrain, an elevation gain and loss of 1000m+ with participants walking and or skiing uphill and downhill across this course. For the purposes of participant safety this is a team event. Teams consist of no more or less than two people. Importantly this race whilst consistent in format with an 'Individual Race' outlined in the Section 2, ISMF it is not intended to qualify or recognised as an ISMF event. The object of the race is to 'check-in' to the 9 course waypoints, a navagation challenge as much as it is a physical challenge, and return to the finish line. These way points will be communicated via an event specific map and digital GPS support in the for of a GIS Plot, delivered and synced with the smartphone App 'Gaia'. There are two categories. Ski and Split snowboard. A pair of Skis or a Split Board with metallic edges covering at least 90% of their length, and minimal width of, for skis, at least 80 mm in the front, 60 mm under the boot and 70 mm in the rear part; ski length must be of at least 160cm for men and 150cm for women. (3 pin telemark bindings excepted). • If front bindings have limited or no release safety system or can be used locked without a safety system, it must be clearly specified in the written information supplied with the equipment that these bindings are designed for competition and don't require a safety release system for the front part of the bindings. • Standard snowboards, without split touring mode won't qualify. Boots (only the shell) must cover the ankles and have notched soles in Vibram or an equivalent. The soles must cover at least 75% of the boot surface. Compass will be required to compete, and obviously the ability to use it. Compass and/or GPS, whistle, waterproof map of the area (Supplied). Helmet (Descent only), Bike helmet will suffice. The race will commence from Telphone box junction(TBJ) (or higher as snow levels dictate), and continue via the north (king spur) and Hut 36 to approach the summit of Mount Stirling (Trig Point). Then to the south summit via a detour to a waypoint in the lower 'dugout creek' vicinity. From 'The Tree' to the bottom of Stanley's bowl and returning via the standard 'bootpack' to south summit to then cross the saddle and descend toward bluff spur and below to a waypoint at roughly the 1500m contour on Bluff Creek gully, the last 'check-in' before making for the finish line on bluff spur trail, at a position nominated by the race director, in consultation with Ski Patrol, based on snow depths on lower bluff spur trail. The course, with the exception of the Bluff Spur descent is not on the marked / groomed areas that are shared with other venue users. Course will be set and open to ski/split inspection. 1200 - Summit Check-in Closes. 1400 - MS 'Summit Tree' closes Stanley's Drop to competitors. Then sweeps skin trail from Dug-out checkin and returs to Summit trig to sweep bluff creek drop. 1500 - 1600 MS 'Bluff Spur' closes Bluff creek drop below Bluff Spur Trail and directs competitors to finish line. Sweeps Bluff creek before bluff spur trail to finish line. 1700 - 1900 Presentation held at TBJ. As this is the first event, we are treating it as a test. We'd between 30 and 50 participants. Wed doubt that there would be many dedicated spectators. 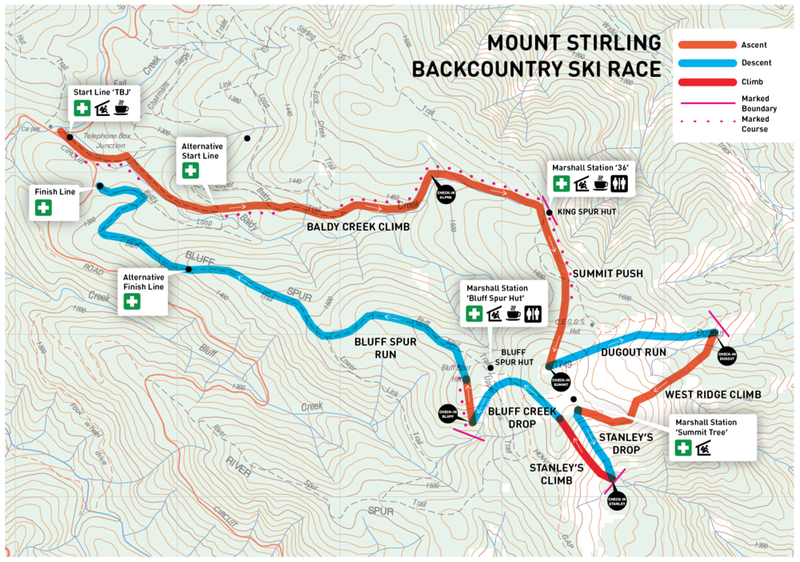 • Mount Stirling Mount Buller Resort Management provide dedicated Ski Patrol staff fronted by the head of Mt Stirling Ski Patrol, Dave McCoombe. These staff are able to act as first responders (often by ski or snow mobile) directly to patients on the trail. paramedics available, stationed at Mount Buller ski resort. 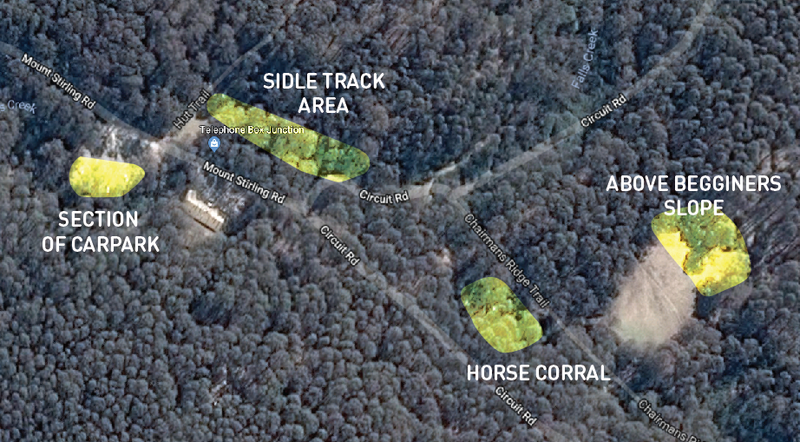 On site there will be a dedicated patient treatment area, at Telephone Box Junction as used by Ski Patrol during operations at Mount Stirling during the regular winter season ski patrol operations. There is good emergency vehicle access to all sections of the course where participants are descending (skiing / riding) per the emergency vehicle access map below. Expected precipitation in excess of 20mm in the from of rain. Snow not lower than 1450m on access trails. Visibility of less than 50m for prolonged (more than 5 mins) above 1600m. Any avalanche rating greater than 'Code Green' as deemed by race director. Participants will be equipped with the map shown above, complete with grid references and direction bearings for waypoints, at the scale of 1:125000. In addition the course will be provided as a GPS plot via the smartphone app Gaia, or any handheld GPS. Participants are urged to turn off mobile data on smartphones for the purposes of saving the device batteries on one of the two devices in a two person team. A nominated navigation device as such. In the event that participants become lost or disorientated, then the Mount Stirling Ski Patrol, lost persons procedure will come into effect. Using a series of marshalling stations, equiped with shelter, and warm refreshments, our marshalls will be tasked with identifying symptoms of either condition and are empowered to cancel the patients participation in the race. You are of legal consenting adult age, in the country within which the event is being held, or you have parental or guardian consent. You are free of any physical, mental or emotional disability & physically fit in every way to be able to participate in this event. Your participation in an event is competitive & like all sports has a risk of physical injury & you fully accept responsibility for all such risks as a condition of participation. You understand & accept that CARL & the event organisers/owners do not accept any liability of any sort for bodily injury, illness or death sustained to or by you, or loss or damage to any of your possessions or goods (e.g. sports equipment, money, vehicles, jewellery, clothing, cameras etc.) what so ever & howsoever their loss or damage is caused. You consent to the recording of your voice, image & likeness captured by any means (including cameras/telephones/ mobile devices) while present in, at or about the event, the transmission of these images/voices in perpetuity by the organiser free of charge, by any means, & waives all moral & legal rights in & to any recordings of sound made or images taken during the event. The organiser reserves the right to cancel the event in whole or in part without notice, for any reason. In such cases a refund or partial refund may be given at the organiser’s discretion, but is not guaranteed. By checking the Event Waiver declaration box on my event entry form, I am indicating that I understand & agree to the above conditions. I hereby agree to indemnify CARL & the event organisers for any & all the claims, loss & expenses of any sort arising by reason of the Terms of Service & of my breach of the above conditions, unauthorised acts or otherwise. Any breach of these conditions or failure by me to obey the lawful directions of CARL or the event instructors hereby entitles CARL or the event organisers to terminate my participation in an event forthwith without any refund of fees or any compensation of any sort & to disqualify me automatically. - Again I can do this, any refreeze you have would be handy. Alex the MSC secretary here has some background in these things so I’ll work with her to get this sussed. We will have a support crew of 2 marshals located at each of the designated Marshal Stations: Hut 36 / Summit Tree and Bluff Hut and four finish line officials working with the race director. These are a mix of one Stirling volunteer ski Patrol Member and an MSC operations crew member at each, working as teams of two. One other team, including the race director will tail the participants on the course as far as the summit, before returning to establish the finish line. The ski patrol director for Mount Stirling is within his powers to allocate areas set aside for camping. Camping areas will be made available within the vicinity of TBJ for the night of the 7th and 8th of September 2018. Here are some of the areas currently open for consideration.